It wasn’t until I read Dead Sky Morning that I realized that Karina Halle is a not just any author but a great storyteller. She had managed to ruin the romance of lighthouses for me in Darkhouse, not that I think I would be tempted to go poking around a haunted one alone in the dark…but you never know. The can’t beat it price of FREE for Darkhouse EiT #1 as of the date of this blog does a lot to sell it but after that the exquisite quality of the series more than sells itself. 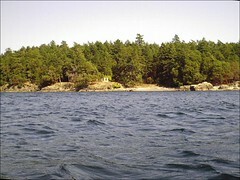 The fourth episode of Experiment in Terror Dead Sky Morning is set on D’arcy Island off the east coast of Vancouver Island the infamous real life location of a former lazaretto or what is more commonly known as a leper colony. The colony was established in 1891 after five lepers were found living in a shack in Chinatown. As pretty as the photos of the New Mexican desert are I am a house cat by nature and despise the heat. Strange I know considering I am of Caribbean ancestry, so I wasn’t overly concerned with the possibility of coming across skin-walkers while driving on deserted highways in the middle of the night. Although Red Fox was entertaining and kept me wondering what else could possibly befall Dex and Perry, the desert is very far from Toronto. Old hotels with a past were also put on the “to avoid” list thanks to The Benson but films like The Shining and 1408 had already made them highly suspect in my opinion. Vancouver is only a short plane ride away and has long been on my list of places to go and now you can be sure I will make sure to see D’arcy Island… from a distance. Always love to read your reviews. Thanks for the pingback! You’re welcome! It’s like we are reading twins these days!